Farid Shenassa is the chief technology officer (CTO) at USAN. In this position, he developed many of the company’s key intellectual property assets, including a unique call-flow scripting language and environment, distributed switch and VRU independent platforms and an SS7 protocol and middle layer. 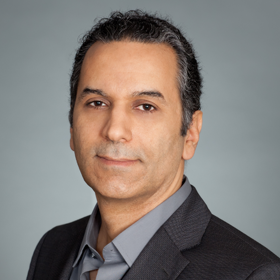 Additionally, Farid has been instrumental in the delivery of other strategic offerings, including Fraud Vision for early detection of non-monetary fraud activity, Positive ANI Signature for auto-identification and authentication of callers, and Engage, USAN’s omnichannel customer engagement platform. Farid joined USAN in 1990 as a software developer and eventually was responsible for the overall technology direction of the company. Even in his executive position, Farid continues to take a hands-on approach to all aspects of platform architecture, software design, and vendor product integration. Prior to joining USAN, Farid held key roles in the computer science and software development field. At CARD*Tel, he developed a real-time calling card and credit card authorization hub. Before that Farid developed a manufacturing control and inventory tracking system for Johnson WireWorks. He holds a bachelor of science and a master of science degree in information and computer science from Georgia Institute of Technology.